Some movies have been so thoroughly analysed – in books, mainstream media and academic literature – that you feel almost silly writing about them. What more can a cineaste of my generation possibly say about Sholay, for example? As the cliché has it, any true movie-lover has seen it at least 30 times (I won’t make such claims for the entire film, but I’ve certainly seen some of my favourite scenes dozens of times). Most Sholay buffs know every line by heart. 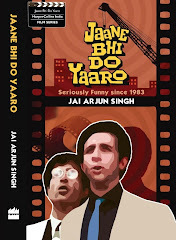 (One of the first audio-cassettes I owned was the two-tape set of the dialogues.) We have deified the film and in some cases, as our cinematic horizons have broadened (or over-familiarity has bred tedium), we have deconstructed, undervalued and perhaps even scoffed at it. Responses have run the gamut from blind adoration to “Huh! Seven Samurai was better.” Pedants (I’ve been one in my time) enjoy telling less informed viewers that the Sholay look – so much more sophisticated than other Hindi films of its time – was inspired by the work of Sergio Leone, Sam Peckinpah and others; that the family-massacre scene – complete with the ominous sound of the wind blowing, and the shot of a gun pointed at a child cutting to a piercing train whistle – derives from Once Upon a Time in the West; and even that the Holi attack includes what might be a small homage to the famous Odessa Steps sequence from Battleship Potemkin! In the Internet age, the film has been further scrutinised and demythologised: we now know, for example, that R D Burman’s classic gypsy tune for “Mehbooba Mehbooba” was lifted from a song by the Greek musician Demis Roussos. On YouTube, you can see the videos of two scenes that didn't make it to the final cut, and which once had near-mythical status for Sholay buffs: an extended version of the morbid scene where Gabbar Singh prepares to kill the young village boy Ahmed; and more importantly, the original ending, which had Gabbar being killed by the Thakur. 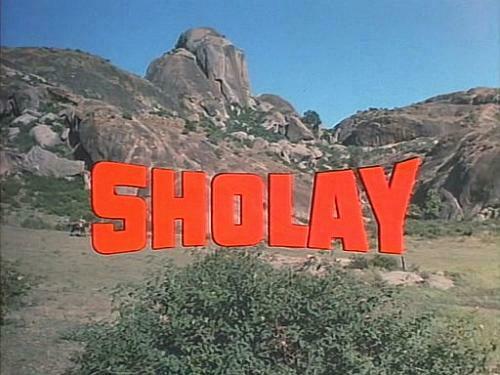 Like every other Sholay fan, I had convinced myself that the film couldn’t possibly hold further surprises for me. But a few weeks ago I saw it on DVD and realised that all these years there was a crucial link missing in my viewing experience: I had no memory of most of the opening-credits sequence, where the Thakur’s manservant Ramlal leads a policeman – on horseback – from the railway station to the Thakur’s haveli. The back-story is that throughout my childhood, my Sholay-watching was done on a videocassette specially brought for me by a Lagos-based uncle on one of his India trips. Bits of the film, including the opening sequence, had been snipped to fit into the cassette's 180 minutes. The first shot – the railway station and the camera gliding down slowly to meet the train – was intact and so were the first few credits (accompanied by Burman’s lilting music and the shots of a sunbaked landscape that might have come from a classic Hollywood Western). But only the names of the six principal actors appeared in this print; there was an abrupt cut from the title "And Introducing Amjad Khan" to the post-credits scene where the Thakur is speaking with his visitor. Whoever cut out the rest of the scene must have figured that opening credits are superfluous – as they indeed were in many films of the time. But watching the full sequence on DVD, I realised that here was one of the best establishing scenes I'd come across in any Hindi film. As Ramlal and the policeman make their long ride, we are taken through the entire setting where the main action of the film will occur. First they pass the talaab where villagers and dacoits alike presumably get their water from (this is also where Gabbar’s men will accost Basanti as she waits for Veeru). As the two riders approach the village itself, the camera draws back to give us an aerial view of the houses as well as the temple, the mosque - and in the far distance, the water tank where the comical "suicide" scene will take place. Long before the film’s central narrative brings Veeru and Jai to Ramgarh, we become acquainted with this self-contained little community. We see the village centre and its people as they go about their daily routines: shopkeepers preparing for the day's business, children playing, women carrying water-pots, a goatherd driving his animals down a rough path. Taken as a whole, the sequence is beautifully staged. (Also note the changing motifs in the score, from a guitar-dominated tune to a more Indian sound as they pass through the village.) 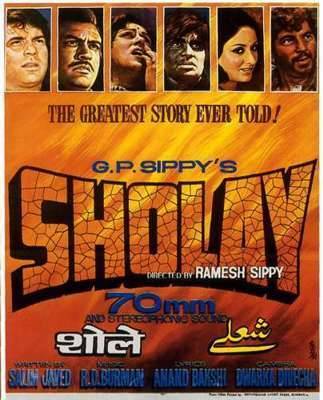 Many Hindi movies of the time leapt straight into a narrative without spending much time on creating a mood, but Sholay is an exception. The film's visual power – its economy of storytelling, its assured shot composition and framing – begins right here, with this almost dialogue-less opening. You seem to be obsessed with opening credits for the past two weeks! Marvin: true! (Who has the time to watch more than the first five minutes of any film?) But as I hope you've noted, this piece isnt't about the credits - it's about the visuals that lie behind them. I guess you already know about this site, but in case you didn't: http://www.artofthetitle.com/. Not quite about opening sequences, but about title credits. There's also a very interesting discussion up on Quora: http://www.quora.com/What-are-the-best-opening-scenes-in-film-history? I did. And I found the comparison with the changes in background score to be a particularly keen insight. I do remember this scene - maybe because we were not shown Sholay as kids- it being deemed too violent for our innocent consumption. But at the Institute, they ran it many times- as part of the syllabus as well as on Sunday mornings as part of mainstream cinema screenings. So, yes- this scene stands out for what you pointed out- establishing the mise en scene and the brilliant, brilliant score! Jai : You are so awesome !! I am amazed by the amount you know, i really am . This is a brilliant post- i've seen sholay a number of times (becuase of my dad , who is a hugeee bacchan fan) and what iv always liked about the film was that it seems to put together , as a unit. sadly , i did notice the connection to west side story. But your post, makes me want to go and see it again . please please keep writing - we love you ! Very interesting..Interesting because the opening scene was the last scene shot for the film Sholay! The scene which touched me the most was when A.K.Hangal mourning his son's death suddenly says "Ab tho namaz ka waqt ho gaya" and goes to offer his daily namaz.. Interesting because the opening scene was the last scene shot for the film Sholay! Karthik: that makes perfect sense, actually. Also, a journalist friend who had interviewed Ramesh Sippy in the 1980s just mailed to tell me it was a deliberate decision to establish the film's topography in this way. Lovely observation. This is so rare for its time.